Our third annual Cedar Park 5K crushed it on 10/4, as 1000+ students ran, jogged, or lesisurely walked (8th grade-- looking at you!) our 5K course. We had flamingos, bubbles, music, and of course, energetic & awesome parents and grandparents who lined the course. To date, our Cedar Park 5K has officially brought in over $53,000, surpassing our goal and last year’s total. And the view from up here has never looked better! Thank you to the 62 parents & community members who showed up to manage, support, & corral the 1000+ students unleashed during our Cedar Park 5K. There's a hundred things on your to-do list, so THANK YOU for making CPMS a priority last 10/4. 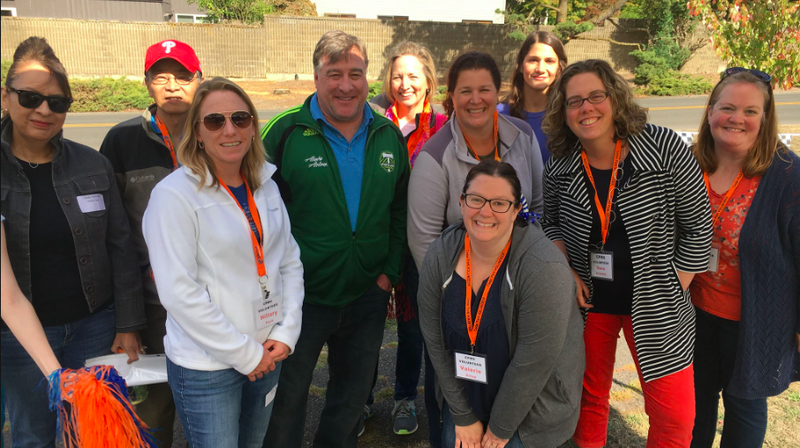 Special shout out to our entire 5K leadership team, including Karen DiPietro (chair), Erika Hammond & Carrie Fox (day of logistics), Bettina Jeszenszky (sponsorships), Melissa Gatchell (financials), Hannah Donohue (promotions), Julie Gupta (matching funds) Brenda Swanson & Jana Drotzmann (procurement) and Tiffany Hahm (prizes). Not only do these teaching warriors WILLINGLY FACE hundreds of tweens and teens each day, they also aren't afraid to get silly and show their school spirit. THANKS to all the staff members who gave us all whiplash and a good chuckle. Teachers earning the spirit awards for best costumes include Mr. Forbes, Mr. Waldrip, Ms. Hattendorf, Mr. Witt, Ms. Massan, Ms. Fitzpatrick, Ms. Hitsman, Mr. Alpert, Ms. Catherall, Ms. Clifford and Ms. McClelland. And an honorable mention to Dr. Anderson for showing us how to deck yourself out in school spirit. That orange wig was, well... tremendous. We'll see you all next year bigger and better than ever. Congrats to these hard-working students who pushed themselves to avoid their meandering classmates and finish first in their class. 6th GRADE: Quinn N. & Ali H.
7th GRADE: Caden S. & Hadley W.
8TH GRADE: Inbaa C & Katelyn S.
***Special shoutout to 8th grader Inbaa C., who had the fastest time of all 1050 CPMS students, completing his 5K in the unofficial time of 15 minutes 42 seconds. Our corporate sponsors have been very generous and collectively added $10,000 to our fundraising efforts-- 20% of our goal! When you patronize the following businesses, please thank them for supporting excellence in education in our community. Blazer Tickets, Timbers Tickets, Top Golf Package, King Pin Bowling Package, 5 Columbia Water bottles, Columbia Hydro Flask, Gift Card to 5 Guys/Fries, Columbia duffle bag, 18 Jamba Juice Coupons, Columbia Blue Backpack, $100 gift cards Pizzicato Pizza, 3 advisories received platter of Jimmy John’s sub sandwiches, 10 Nike Backpacks, 4 O and FS water bottles, $100 Noodles & Company Gift Cards, 11" Mod Pizzas (10 total), Baskin & Robbins ice-cream party for advisory, 5-Target $10 gift card, 100 free ice cream cones at Baskin Robbins, 6 Mugs and free coffee from Coffee Rush, $500 Winco gift cards. THANK YOU TO THESE AWESOME BUSINESSES! And that’s a wrap on our PTC fundraising for the year. We will see you in 2019! Our 5K fundraiser is wrapping up this week and we are crazy close to our $50,000 goal. With just $3300 left to go, we are closing in on the win. This is the PTC’s ONLY fundraiser all year, so let’s break down our PTC budget to see where your money goes. Curious what your generous donation funds? Let’s answer all your burning questions. Where does this money go? I need examples. Also, an ASTONISHING 39% of our budget provides transportation and fees for a unique field trip experience for each grade. That’s money for EVERY SINGLE STUDENT. 6th grade has already enjoyed Outdoor School, while last year’s 7th grade explored PSU, and the 8th graders spent a day at Oregon State. These educational experiences are a memorable part of our students’ education. Sounds good, but can I see the budget as a pie? Grade Level Student Experiences (green) = Transportation & costs for grade-level field trips. Last year, 6th went to Outdoor School, 7th explored PSU, and 8th enjoyed a day at OSU. I see there’s a line item for “Schoolwide Support.” Seems suspiciously vague. What’s that all about? So glad you asked. The PTC provides Dr. Anderson with a “Schoolwide Support” line item that gives her the necessary flexibility to fund the ever-changing needs of Cedar Park. This line item allows for specific team, teacher, and grade level requests. power cord strips for classrooms. So, ummm…. yeah. Hope that was specific enough for you. A lot of unseen support and heavy lifting comes from that single line item. Sadly, it’s the one that will be impacted the most if we don’t make our goal. I’m an 8th grade parent and I’m just over it. Oh, honey. We get it. However, ANY AMOUNT donated is incredibly helpful. Cedar Park PTC does not have a large enough savings to cover our expenses this year, so we are quite literally fundraising for our expenses and for your student THIS school year. The 8th grade field trip, and the 8th grade send-off are all powered through this 5K fundraiser. It’s the collective effort that makes the biggest impact, so please consider donating whatever you can. It quite literally, ALL HELPS. You’ve inspired me. Can I just donate to the cause online? Totally. Go to https://www.firstgiving.com/event/411287/2018CedarPark5K. Any amount puts us closer to our goal of $50,000. 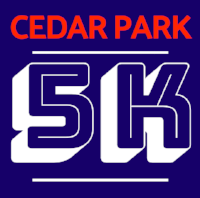 Head to www.cedarparkptc.org for all the latest news or chat with Karen (cedarpark5k@gmail.com). With just TWO DAYS before our largest fundraiser of the year, the 5K team is busy confirming and securing all the small details. It’s going to be such a fun event— and we’d love to see you there. Take a moment to look through these volunteer opportunities to see where you can contribute. It’s ESSENTIAL we have enough volunteers to maintain the fun and safety of this event. Plus, it’s an excellent way to meet, socialize, and generally connect with other Cedar Park parents. Feel free to sign-up for any shift, regardless of your child’s grade. Don’t forget to wear blue and orange! Participants will be released in waves. Competitive runners at 9:20am, walkers/joggers around 9:30am. Participants will be released in waves. Competitive runners at 12:10pm, walkers/joggers around 12:20pm. Participants will be released in waves. Competitive runners change at 2:23pm, walkers/joggers around 2:33pm. Students will need comfy clothes, appropriate shoes, and a water bottle! Our 5K effort is happeninig! Eight students are taking home some free prizes this week as part of our first of four 5K raffles. Congrats to 7th grader Kiarah O., who is our big winner of the KingPins party for six. The following five students won Columbia water bottles: Ashley N. (6th grade), Caitlyn S. (7th grade), Kaiden C. (7th), Grace B. (7th), and Bridget N. (7th grade). Quinn N. (6th grade) has won a Columbia hydroflask and Wyatt C. (7th grade) walks home with a Five Guys gift card. Our giving continues next week with another raffle and MORE PRIZES! Each unique donor on a student’s fundraising page will earn them one entry to win a Top Golf gift card. The more donors you have, the more chances to win! Other prizes next week include a Columbia duffle bag and six Jamba Juice coupons for you and a friend. 1. The 5K is the Cedar Park PTC’s only fundraiser. Forget the extended magazine sales or monthly dining nights. Your parent-teacher club (PTC) is getting it done RIGHT NOW, so we can spend the rest of the year relaxing & watching our hard-earned donations being spent on our kids. 2. Donors have payment options-- online or donation envelope. Families can set-up an online Firstgiving fundraising page & solicit donors from family & friends across America. But if you’d rather just keep it old school & write us a check (or stuff a little cash in an envelope), we’ll take that too. Either way, it’s tax deductible!! 3. The 5K provides some pretty cool stuff that KEEPS CEDAR PARK AWESOME. This 5K does it all– bulking up the robotics lab, supplementing our after-school clubs, providing transportation for educational field trips, and most importantly, filling in those gaps where the regular school budget just ain’t cutting it. HERE'S HOW LAST YEAR'S FUNDS WERE PUT TO GOOD USE. Want nitty gritty? Head to www.cedarparkptc.org/business to poke through our financials. 4. We need parents to make the day LEGENDARY. The 5K team has got some pretty awesome ideas in their back pocket (one word: FLAMINGOS) but we can’t pull it off without YOU. Take a moment to sign-up for a shift to make magic happen on 10/4. Got your background check figured out? All your info is at www.cedarparkptc.org/volunteering. Head to our 5K Firstgiving website, where you can build a simple and secure online fundraising page for your student, and qualify them for next week's Top Golf raffle. Still have questions? Chat with Karen (cedarpark5K@gmail.com) or head to www.cedaparkptc.org/fundraising. The countdown begins to our Cedar Park 5K fundraiser, scheduled for Thursday, 10/4. Materials regarding the 5K went home with students last Friday. The Cedar Park 5K is the Parent Teacher Club (PTC)'s only major fundraiser of the year. Funds support all the amazing stuff that keeps Cedar Park awesome-- such as enriching field trips, art lit, and the classroom support not covered by the school's regular budget. Still not sure? Check out what was purchased last school year. So take a moment and set-up your student's fundraising page at https://www.firstgiving.com/event/411287/2018CedarPark5K. Parents have through Thursday, 9/6 to set up their student's page to be entered to win. Questions? All your info is at www.cedaparkptc.org/fundraising or check your student's backpack for the Cedar Park pledge envelope and handout. Feel free to email Karen, 5K Chair at cedarpark5k@gmail.com.